Gout acid is usually uric acid that has formed crystals in your joints. But that’s not the full story – there are 4 ways that acid can cause gouty misery. You need to know them all – and how to avoid the gout acid blues. Surprisingly, uric acid by itself causes absolutely no pain. We often think of acid burns, and inflammation, e.g. when excess stomach acid causes heartburn. But uric acid is very weak. It causes no direct pain, but indirectly it can lead to the worst pain know to man. When you understand how it works, you are best placed to avoid all four types of gout acid pain. 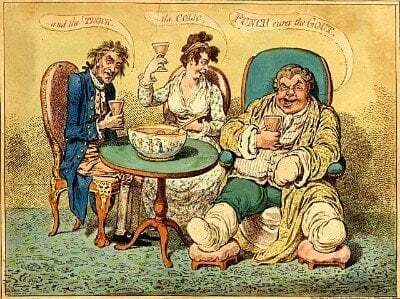 The classic gout pain caused by uric acid crystals in the joints. This is not physical pain. It is an inflammatory reaction to invading uric acid crystals, when the immune system tries to kill the invaders in the same way that it deals with viruses and other infections. This pain is not permanent, and will go away naturally after a few days, though most of us need pain relief as the pain is very intense. Uric acid is excreted by the kidneys, then substantially reabsorbed. High levels of uric acid can crystallize in the kidneys, causing painful kidney stones. In most cases, the stones are easily dissolved with sodium bicarbonate and plenty of fluids. Pain lasts until stones are passed or dissolved. Risk of permanent damage is low, but will increase if stones recur frequently. Uric acid crystals form deposits known as tophi (plural of tophus). These frequently form under the skin, and can restrict movement near joints. When they grow to the point of bursting through skin, they can cause physical pain of tissue damage, and also leave an open wound which often becomes infected. If treated with surgery, pain should stop once the injury heals, though some scar tissue may cause permanent discomfort. Unless underlying cause of high uric acid is treated, the tophi will grow again. Uric acid crystals in joints cannot be killed by the immune system, so they get hidden by a protein coating from defending white blood cells. The resulting microscopic particles attach themselves to tendons, cartilage and bone surfaces. Like tophi under the skin, these deposits continue to grow, often unnoticed. In joints, the deposits grow into bone and other tissues, causing permanent damage to the joints. Whether you call it uric acid or gout acid, you must be on guard against it’s dangers. It is easy to measure, and usually easy to control. If you fail to take action, you can be certain that one (or all) of the four types of gout pain will get you. The longer you leave it, the more chance you have of getting permanent, serious damage. As you get older, you will be less able to cope. Get your gout acid measured and controlled today.